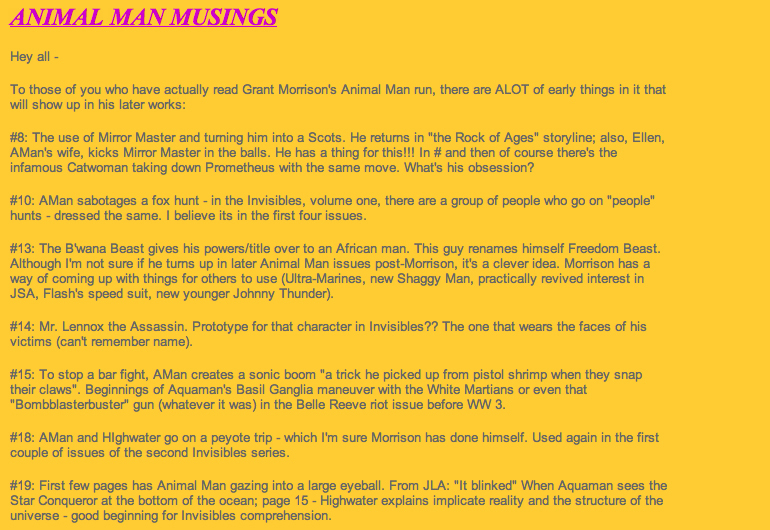 A collection of very surface-y thoughts from my old 2002 AOL homepage on comics on the Grant Morrison Animal Man run. I used “musings” as a way to dump a bunch of quick thoughts on a subject – and rereading these snapshots, boy is this topic unrefined and underdeveloped. Maybe that’s why this post fell under the “Ramblings” section. 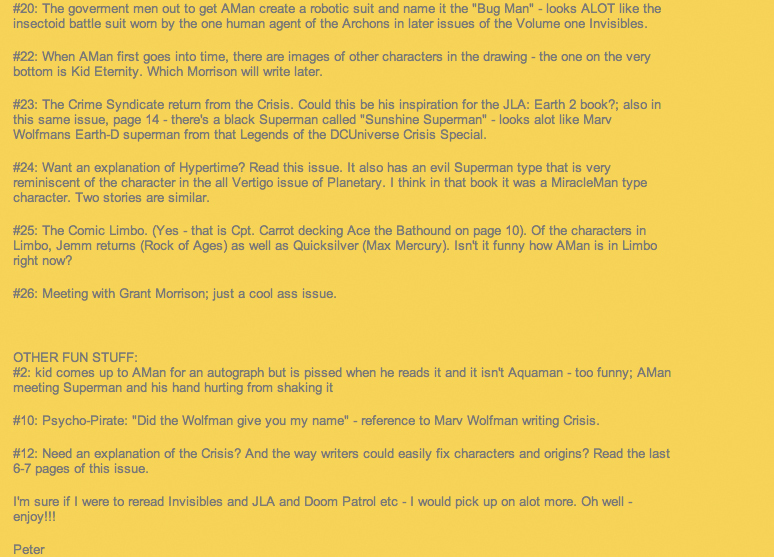 I love me some Grant Morrison comics, and this is really a list of notes, but you can tell I was just starting to scratch the surface on this series. Even still, there are a few connections made in the following that I’ve forgotten about. Enjoy! This was great, Pete. Makes me want to go re-read Morrison’s Animal Man run now. All the connections you cite between various Morrison works – I am certain I picked up on none of that, but it makes sense. Look at how Seven Soldiers intertwined those disparate mini-series. It also makes me think about a series of posts Tim Callahan did at CBR, three parts spanning “Morrison’s Superman Saga,” which put all of his various stories with Superman into a cohesive over-arcing single narrative. It was interesting reading, and the third part is in the link below (which also has links to the first two parts in its opening paragraph). It can sometimes be mind-boggling (If I may use that hyperbolic term) to see how Morrison is able to weave these many plots and stories into something that appears to be one long tale, and it’s part of what I appreciate most about his work, especially since he doesn’t seem to hit readers over the head with it, for the most part, which might also mean it isn’t as deliberate as we might think. rambling now, so I’ll sign off. You’re definitely on track with your thoughts. Many of the connections probably aren’t deliberate – and sometimes I think that’s the point, ya know? That’s the idea that Morrison likes to play with: sentient ideas, recurring themes, accidental echoes, etc. Plus, some of it is just part of the Morrison “vocabulary” – such as those insect-armor characters – I think he just likes to reuse them because they are visually interesting on the page. All to say – there’s so much to think about (and read about) when it comes to the work, and I find new things every time I read it.